In Texas, it can be Sunny, Rainy or Snowing, sometimes all in the same day! 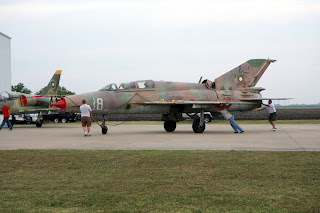 In continuing our progress on the Cold War Air Museum, MiG-23, the guys took advantage of a brief respite in our recent rains to roll out Bord 022 and do some tests. APU start? Check. Engine start? Check. Brief taxi run? Check. Gear in the Mud? Check. As we get older, we continue to find that life is a series of learning experiences. Because of the recent rains, the gear quickly bogged down in the soft ground beside the ramp. With the co-operation of the airport management, who NOTAM'd the taxiway out of service, we called our friendly crane company who happened to have the needed equipment just down the road. 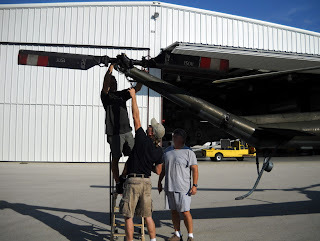 These guys have assisted in the past with rigging and lifting, especially when we have off loaded the aircraft on arrival (see the Mi-24 coming out of the box and the Mig-23 coming out of the box). With a quick lift, we were soon back in the hangar, although some of the "boys" were covered in good Texas mud (and a bit of chagrin). And while the taxiway was temporarily closed, the local police department took the opportunity to come out and practice using "Stop Sticks". With the locals checking the moorings on their Arks the day before and the day after, we picked a good day for everyone to get outside and enjoy the Texas weather. Getting Stuck in the Mud ---- Priceless! We will have videos of the happier and drier portions of this exercise posted soon and with the skies once again blue and clear, we hope to have more stories to tell and video to post after the weekend. Hi, I'm Pete Taylor and I have been a volunteer associate at the Cold War Air Museum for over a year now. 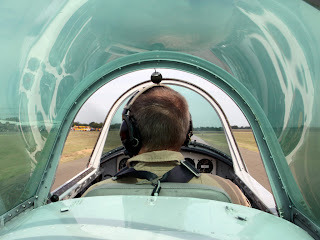 While I'm not into the Video Blog thing, the guys at the museum asked me to share a little bit about my flying background with our blog visitors. After serving four years in the infantry in the states and Germany, I was given the opportunity to enter OCS followed by flight school. Like everyone else in helicopter training at the time, I attended primary training at Fort Wolters near Mineral Wells, Texas with secondary training at Fort Rucker in Alabama. After graduation, I received my ticket to Vietnam where I served with the 1st Aviation Brigade, 116th Assault Company. After about three months in the Co-Pilots seat of a UH-1, I graduated to Aircraft Commander (AC) and completed my tour with the unit as the Operations Officer with about 1200 hours under my belt and railroad tracks on my collar. Returning to the states, I was assigned to Fort Wolters as an Instructor Pilot (IP) in the TH-55 and also served as Operations Officer, XO and CO of a training flight before completing my commitment and leaving active duty in 1971 with another 1500 hours of IP time. (The museum has the civilian version of the TH-55, a Schweitzer 300). 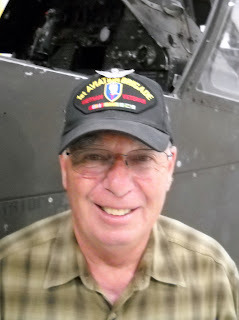 During the early 70's I continued to fly as a “weekend warrior” with Army National Guard units, first in Texas as an AC and IP in UH-1's and then in Connecticut as an AC, IP and Instrument Instructor. 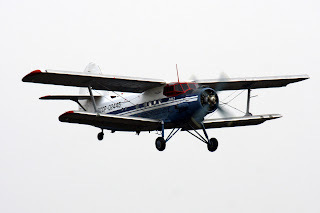 Leaving the U.S. temporarily for Canada in 76, I flew fixed and rotary wing charters in Western Canada for about five years including fire service work most summers in a Hughes 500 with a bucket. After my tour at Rucker, I worked for Mediflight service based in Oklahoma City, flying both fixed wing and and rotary wing aircraft again. 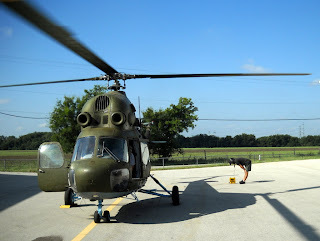 Learning from one of our “customers” about a guard unit with a need for pilots, I once again put on my weekend warrior wings and joined the Kansas National Guard where I served as a CH-54 Aircraft Commander and UH-1 IP. The CH-54 is better known by its civilian variant name as the “Skycrane”. With a 72 foot rotor diameter and a 47,000 pound maximum takeoff weight, it is still one of the largest helicopters in the world. With over 7,000 hours of rotary wing time and a variety of fixed and rotary wing experience, Pete is definitely one of the Senior Aviators associated with the museum. Besides that, Pete, like most of the associates we count on, is a genuine, hard working guy that is willing to share his experience and concern for safety. We are lucky to have him helping us at the museum and salute his experience, both military and civilian. 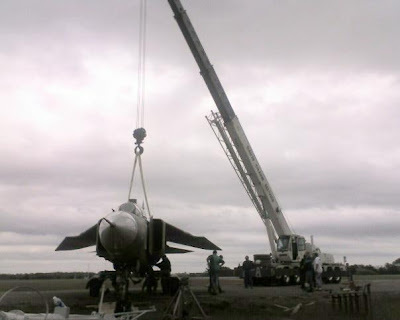 At the Cold War Air Museum, we are again working on the MiG-23. The 23 has an unusual ventral fin for added stability in flight. Here it is shown retracted to the side so that it does not scrape the ground on landing or take off. Fin retraction is tied to the landing gear system. It automatically extends when the gear is retracted and retracts when the gear is extended. We were able to see this (and a lot of other things as well) while checking some of the hydraulics and the gear system yesterday. Sean, one of our volunteers, captured several clips of the gear and ventral fin and provided them to us for the blog. Thanks Sean! At the beginning of this clip the gear is being retracted and the ventral fin can be seen moving to the down position. Almost immediately the gear is extended again as the camera shifts to a different view. Upon full extension, the view quickly shifts to the tail to show the fin flipping back to the side again. 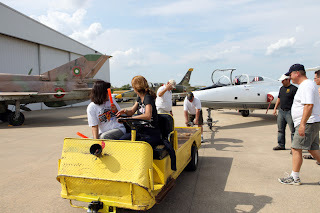 A young man recently visiting the museum called the MiG-23 a "Transformer" plane. Like the action figure series, it has lots of large moving parts and is capable of some pretty fancy reconfiguration. The clip below shows another view where at first you can almost imagine a mechanical arm reaching out from some large mechanical war machine. Oh yeah, in reality, that's pretty much what it is. The video continues long enough to again show the ventral fin changing position under the tail (the "click" noise associates with the fin unlocking to change position). Oral histories have been a popular method for museums to harvest and preserve "snippets" of history. The Cold War Air Museum is experimenting with video posts, to introduce projects and associates, tell stories about aircraft and events and to capture and preserve oral histories from those willing to share their story on line. Another ongoing project is developing audio and video displays to accompany each aircraft in the museum, allowing visitors to walk through the museum and replay information and interesting videos about aircraft and events at their own pace. If you are interested in helping to develop this project, or you have stories or know someone who does, please post a comment below, or e-mail us through the contact page on the main museum web site. Our sister museum on the field, the Commerative Air Force (CAF), DFW wing, recently sent their transport aircraft off for some repairs. Always an attraction, we're glad to see her back. The Civilian DC-3 type saw extensive service during WWII under several military designations, R4D being the U.S. Navy variant. This aircraft, equipped at the time with depth charges, saw service off the coast of the U.S. as a submarine spotter. The Cold War Air Museum, salutes this aircraft and the men and women of the CAF for their dedication in keeping this increasingly rare piece of history flying. As the Officers and Directors of the Cold War Air Museum well know, repairs on aircraft always seem to take longer and cost more than expected. The DFW wing is fortunate to have on board one of the most succesful and dedicated fund raising teams in the State. Charlie Wood, Wing Commander of the DFW squadron shared with us some of his stories from the unit and his fund raising experience. Not only are the dedicated members of this unit on track to pay for the R4D repairs, but another unit in the area is working with Charlie and his team as well, raising major funding for the B29 and B24 groups. All museums are facing critical times in the present economy and many, such as ours are busy learning how to do a better job of reaching out to the public for support. Charlie is one of the many members of this group who have significant stories to tell about their experience, either in the Military or in Civilian attire. The Cold War Air Museum Blog will be featuring a historical series from those associates who are willing to share their stories in future posts. As stories are added to the blog, they can be aggregated (brought together for viewing) by clicking on the labels below each post. Although Phil Davis has been introduced and pictured many times before, today is a special chance to recognize him in our blog. A retired IBM'er and Cold War Era Veteran, Phil has been a volunteer with the museum for more than four years. He has seen the problems and challanges we face and helped present our programs. In addittion to his business experience, Phil has also served in other fund-raising and charitable organization roles. Now on the Board of Directors, he is ready to help us expand and challange the community to help us grow. We may get a better picture of him for the main Cold War Air Museum web site when it is updated, but this picture serves him well, as every visitor he has greeted will instantly recognize and remember that smile. 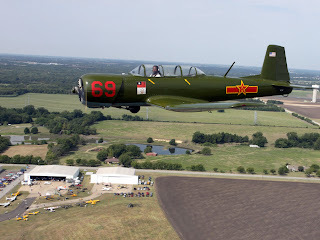 If you are new to our blog, The Cold War Air Museum is a 501(c)3 non-profit organization dedicated to the restoration and maintenance of Cold War era aircraft with a special emphasis on aircraft flown by the former Soviet Union. 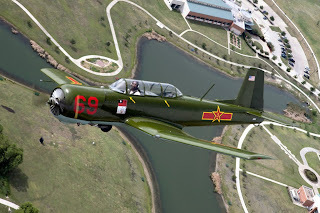 The Cold War Air Museum, Inc. is a member of the Texas Association of Museums, the American Association of Museums, and the North Texas Association of Aviation Museums. We are located at the Lancaster Regional Airport in Lancaster Texas, a suburb of Dallas/Ft Worth. 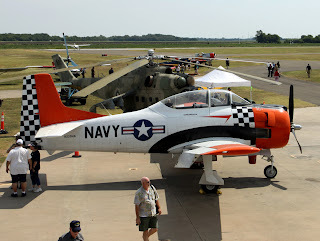 Aircraft associated with the Museum have participated in local, regional and national fly-ins both in static and in-flight displays. Through its web presence, the Museum also actively displays its aircraft, exhibits and programs to viewers in all 50 states and more than 30 foreign countries. 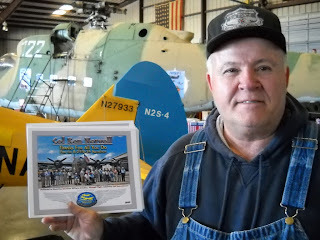 The Cold War Air Museum is a collection of Sponsors, Volunteers, Programs, Facilities, Aircraft and Exhibits. We work with local schools and charities in fund-raising events and civic, science and technical training programs. Many outstanding and experienced individuals support us with the donation of their time and aircraft. Last year more than 4,000 visitors passed through our facility, we hosted or co-hosted five on-airport events and participated in eleven off-airport events before crowds totaling in excess of 40,000. You can click on the "event" label below to view pictures and stories from some of these events. We are glad to have Phil as a new director, he can be reached by email at email Phil Davis or through links on the main museum web site. He is anxious to hear from new volunteers. The Museum is open to the public at no charge every Saturday from 10 to 4, check the museum schedule and location page for an aerial view of the airport and parking areas or click here for an area map. Select "get directions" for driving assistance. Round engines, Russian Aircraft and most retired military equipment share a common trait: "If its not leaking, its out of fluid". Cleanup is an ongoing process. 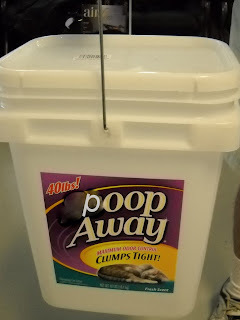 One of our volunteers brought in a large container of Kitty Litter to help. We were concerned about the expense and explained that while we appreciated the help, we could not afford to rountinely buy kitty litter instead of the other cleaning materials we use. He explained "It was no burden, this was just sitting around the house because my cats refuse to use it". The name on the box has been changed to avoid any slight to the manufacturer, after all anyone who has a cat knows they can be picky. Just ask any cat, my job as a cat owner is to find out what they want and deliver it. On the other hand, if the manufacturer contacts us, we will fully endorse their product as effective aircraft litter and as the product description promises, it clumps tight! 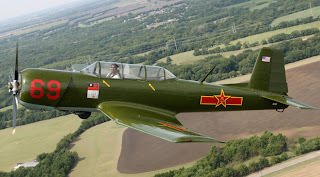 Coverage of the Cold War Air Museum aircraft at the 9/05 event continues with pictures of the Nanchang CJ-6A's that flew at the event. The CJ's complimented the CAF aircraft and our jet and helicopter displays. It's always a pleasure for Miles to fly up and join us at these events. His CJ, Bord 69 is a beautiful example of the type. Clicking on the photo will enlarge it to show more details of the plane and the ground displays below it. Kevin, our intrepid photographer friend, couldn't pass up the chance to go out with the two Cj's while they did some air work. The reflections from the tinted plex give Jon a "Halo" as they taxi out for takeoff. The CJ has classic lines and its "round" engine makes classic noises, just right for air shows. 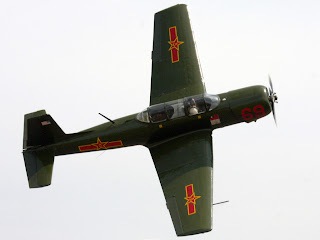 Allthough the CJ's are distinctly different from the Russian Yak-18, they are frequently called Yak's in the airshow circuit because of a similarity of design. 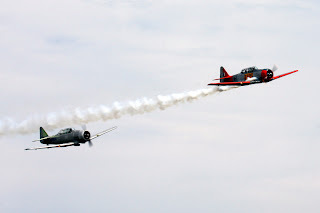 The two types, Yaks and CJ's often fly together. The nose wheel, seen in trail below the fuselage does not fully retract by design. The wheel extending slightly below the fuselage will roll, reducing damage if the student forgets to extend the gear on landing. 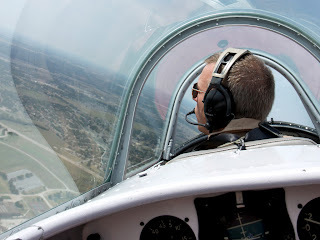 Once clear of the airport area, Jon cleared a practice area and the aircraft began some turns so the photgrapher could get some aerial shots. The CJ shows its classic lines in all profiles. After giving Kevin the opportunity to get some photographs, the planes head back to the field. Thanks and picture credits go to Kevin, www.sectorkmedia.com. To aggregate the posts and pictures from this event, click on the 090509 label below. Clicking on other labels will agregate posts for these aircraft or all events. Coverage of the Cold War Air Museum aircraft at the 9/05 event continues with pictures of the jet aircraft furnished by the museum. The jets complimented the CAF aircraft and our Mi-24 and Mi-2. See a prior post for pictures of the Mi-2 flying during the event. Several platforms allowed visitors to look into the cockpits of the trainers. 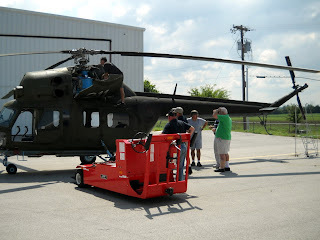 Moving the aircraft into position and returning them to the museum at the end of the day was an "all-hands" job. 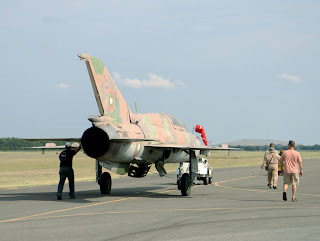 It turned out that the tow bar we had anticipated using for the Mig21 did not fit. An alternate rig allowed the arcraft to be moved from one end of the airport to the other. Final placement of the Mig was by hand. At the end of the day, everything that was moved out for display was returned to the Museum's home base. Thanks and picture credits go to Kevin, www.sectorkmedia.com. To aggregate the posts and pictures from this event, click on the 090509 label below. 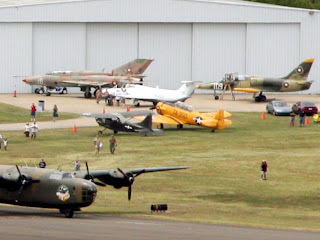 Continuing our coverage of the Commerative Air Force (CAF), DFW wing and Cold War Air Museum 9/05 event. 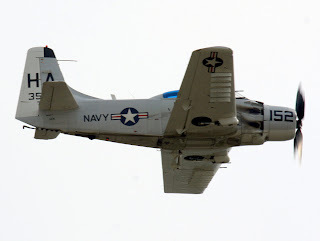 The Skyraider flew in from the Cavanaugh Museum. This T28 lives here at the airport. The B24 can be seen flying over this beautiful T6. 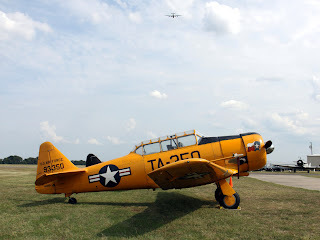 This pair of T6's flew throughout the day. 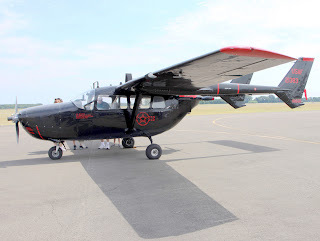 and an O-2 were among the visitors. 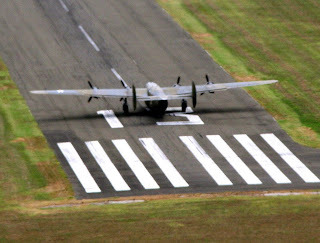 This aerial view shows the B24 about to take-off, its wingspan is wider than the runway. Another crowd pleaser was the display of military and antique vehicles. 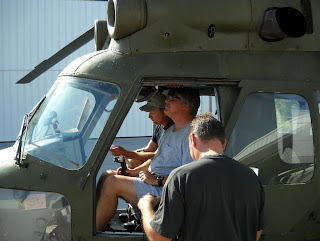 the Cold War Air Museum, Mi-2 got its turn with the electronic balancing machine. As the blade tracking is adjusted to perfection (or as near as possible), the plane view of the rotor disk (as seen from the side) tends to get smaller or disapper completly. Johnny studies the readouts from the sensors attached to the tailboom. Before the run, the sensors were attached to the tail. Other runs were made with other sensor placements. Here sensors are being placed by the transmission while the usual crew of "supervisors" discusses the operation. After each run, the pilots, techs and mechs talk things over.